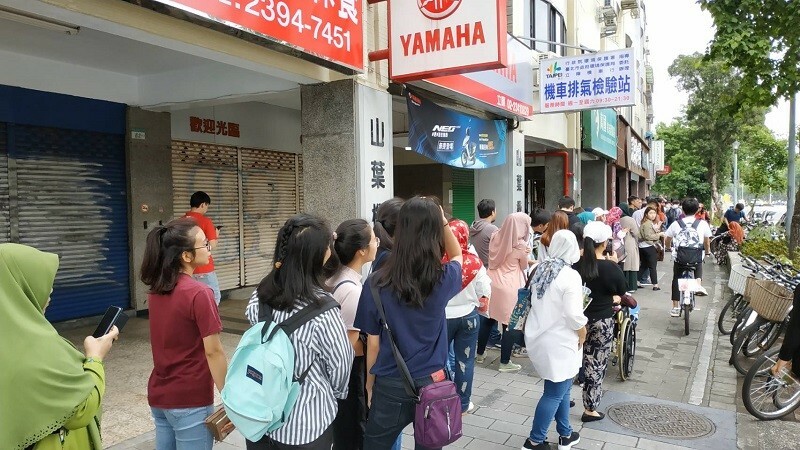 TAIPEI (Taiwan News) – Indonesian workers and students lined up at a polling station near the Taipei Grand Mosque in Taipei on Sunday to cast ballots in early Indonesian General Election. The election is to elect an Indonesian president, vice president, and legislators (People Representative Council / DPR). The overseas voters cast their ballots from April 8 -14, which is earlier than the voting day in Indonesia, which is on Wednesday, April 17. It is Indonesia’s 5th overseas election held in Taiwan, with the first being held in 1999. According to Taiwan's Ministry of Labor (MOL) statistics, there were about 269,000 migrant workers from Indonesia as of the end of January 2019, and they account for about 13.46% of Indonesia’s approximately two million overall overseas voters. In 2019, there are 34 polling stations and four mobile polling stations, across Taiwan. The moobile polling stations are a special system for fishing crew members. Voters who mostly are household assistants and caretakers and do not have much free time, along with those who are living in rural areas, can vote through the POST method by turning in the ballots they have received via the post office, according to Indonesian sources. In an earlier letter to Taiwan's employers of registered Indonesians, Didi Sumedi, head of the Indonesian Economic and Trade Office (IETO), asked them to give their employees the day off on April 14 so they can vote, stating that the election is very meaningful to the future development of Indonesia. After the polls close, all the ballots will be gathered and counted at the IETO, and the vote counting might take five to six days, according to a police officer at the polling station near the Taipei Grand Mosque. He said Indonesia sent three law enforcement officers to Taiwan for the election, and they will station in Taiwan for about two weeks to work with Taiwanese police to secure the polling stations across Taiwan, and to make sure law and order are followed. He said they will also monitor the vote counting at the IETO. An Indonesian voter who is a college student in Taiwan said he felt lucky to be able to vote in Taiwan for the first time, adding that he had never thought he would be able to do that before coming here about four years ago. Another voter who is a caretaker said her employer let her have Sunday off so she could go and vote. She said that she was very happy to be able to vote in Taiwan as the election and the democratic system is very important to her country.